Fabricio Coloccini has assured Newcastle United supporters that he is as determined as ever to give his all to the club. The future of the Magpies skipper has been in doubt since he asked to leave for personal reasons. Manager Alan Pardew announced on Friday that the Argentine would be staying. "I have to be true to the club," said Coloccini. "The fans have to know and be sure that when I am on the field, I give 100%." 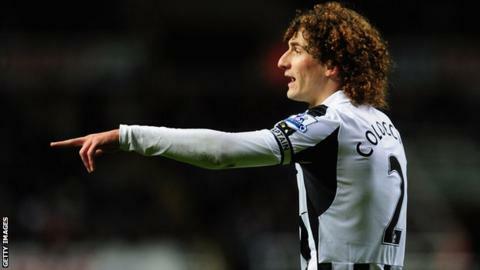 Coloccini, 31, explained that the personal problems which prompted his request to leave have been difficult to handle. But he insisted he is fully focused on helping Newcastle stay in the Premier League after a poor run of form. "I think everybody has problems outside of their work in life," added the former Deportivo La Coruna player. "It is difficult, but now I am here and all I have in my head is to make sure we are in the Premier League next year. That is my only objective. "I heard in the city and around the club that the fans think I have my head elsewhere thinking about other things, or that I am not the same player as last season. "But like I say, for me football is my life - I love it. When I am on the pitch, I give everything to win. "I have been here five years and Newcastle has given me a lot and done a lot for me. I have to be true to the club. I will give 100%." Originally from Cordoba in Argentina, Coloccini joined Newcastle from Deportivo for £10.3m in 2008 and signed a new four-year contract with the club last year. His appearances this season have been limited because of a hamstring injury picked up on international duty and a three-match suspension after being sent off against Liverpool. But his performances have drawn praise from Pardew, who said that watching him against rivals Sunderland in October was "like watching Bobby Moore". Speaking last week, Pardew said: "We have managed to persuade him that, as much as his family, we need him. "He will remain as captain, which is fantastic news." Both parties will re-address the issue at the end of the season, but Pardew added: "He has shown fantastic loyalty to see us through to the summer at the very least."